For investigation of the curing behavior of thermosetting resin systems, composite materials, adhesives and paints, Dielectric Analysis (DEA) in accordance with ASTM E2038 or E2039 has stood the test of time. The great advantage of DEA is that it can be employed not only on a laboratory scale, but also in process. For measurement of the ion conductivity, which is calculated from the dielectric loss factor, or its reciprocal value, the ion viscosity, NETZSCH offers single- and multiple-channel DEA systems, depending on the application, which operate in various measurement and frequency ranges with different types of sensors. DEA 288 Epsilon - Dielectric Analyzer. The multi-functional design of the DEA 288 Epsilon (including furnace or laboratory press) allows for the application of a great variety of different test conditions such as heat, cold or UV light. This enables the user to easily and conveniently determine the best parameters for processing the material. A complete dielectric analyzer consists of the DEA electronics and a sensor. Disposable sensors are connected via an adaptor box. Four models of DEA 288 Epsilonare available: the regular laboratory version and the slim version with small footprint and two industrial versions. thermal analysis and thermophysical properties detection which is also reflected by its physical design of our 200 series. The footprint of the laboratory version is identical to that of a DSC or a TGA system. Additionally, the multi-channel option allows up to 8 samples to be measured in one run, making this instrument ideal for process development. 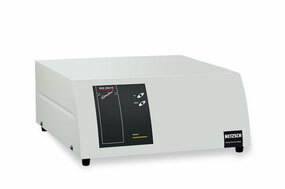 The portable DEA 288 slim version with up to 2 DEA channels offers optimum test conditions for thermosetting resins in the lab or in an industrial process by occupying only a small footprint. For in-process cure monitoring, two industrial versions are available: the standard industrial version and the 19” rack version for an electrical cabinet. Both versions can support up to 8 DEA modules which can be extended for up to 16 channels each. Practical Set-Up for Sample Handling. Dipping of the sensor in a liquid.